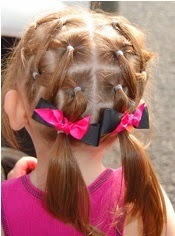 A cute, simple and elegant hairstyle for little girls with long hair or medium length hairstyle. Is so cute for a little girl to wear to a kids party. 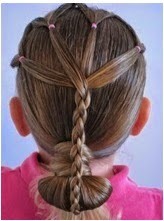 This is a very nice and very easy to do hairstyle for little girls. It is a hairstyle that is suitable for girls of all ages, as long as you have enough hair and at least give him shoulder. These are two hairstyles that can be used for girls attending birthday parties or other celebrations that merit a cute hairstyle for girls child.